I’ve written before about our wonderful butcher, T L Norman of Princes Avenue, Hull. They’re an old fashioned butcher, and keep a lot of stuff out the back (not unlike Hilary Briss in League of Gentlemen, now I come to consider it), but of late he has installed a chill cabinet in the shop, and it is my downfall. Therein he puts all manner of things to tempt me – I go in for a dozen eggs, and come out bankrupt. Today, I called in for a chickie! for the weekend, and some bacon – the weather looks foul, so we shall be hunkering down at home, I think. And there it was – a cut of beef I’ve never even seen before. I picked it up and Craig beamed; “I thought you’d like that”, he said. “It’s a rising rib, or known as a Jacob’s ladder”. And we did. So I bought it – rude not to, really. 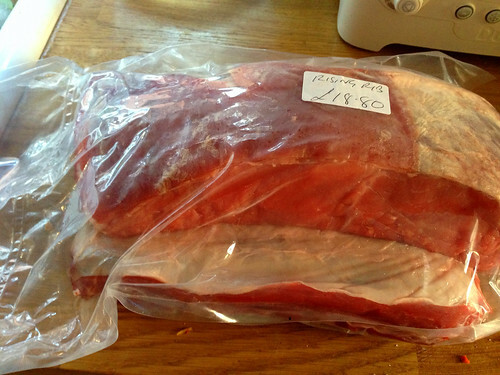 3.3kg of prime beef for £18.80. It’s gone in the freezer to be cooked on my 60th birthday weekend, when the family are here. I certainly won’t be cooking it like this, though. Absolutely not. No question whatsoever. Pete and I were on our way back from Aldi when we stopped at the butcher. We bought a mound of veg, cold meat, dishwasher tablets and washing up liquid, cheese, cream, an apple strudel, some seedy rolls for lunch, some naan, and lord knows what else for £27 odd, and congratulated ourselves on our thrift. And then we were mugged by Normans again. Ho hum.